Dining Table: 36″ Round x 31″ Height, Table has 2″ Umbrella Hole in the center. Dining Arm Chair:23.75″ W x 22.25″D x 35″H, Fully Assembled, stackable for easy storage. 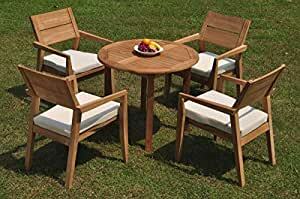 Constructed from quality solid teak wood and secured with glued mortise and tenon joints. Chairs are fully assembled and stackable for easy storage. Set includes: 36″ Round Table and 4 Vellore Stacking Arm Chairs. Pictures shown with more chairs is for illustration purpose only. You will receive only 4 chairs. ** Wood Umbrella Hole Plug is also provided. ** 2″ Umbrella Hole is available in the middle of the table. ** Umbrella is not included with the set, but can be purchase separately, please inquire. ** DON’T FORGET TO ENQUIRE ABOUT OUR SUNBRELLA CUSHIONS (SOLD SEPARATELY) ** If you need more chairs, please let us know. ** Assembly: Very little assembly is required. This furniture will be delivered in partially assembled sections. Assembly is quick and simple. **Accessories shown in picture are not included with the set. Please inquire if you are interested.